Yup! ISB is ranked 12th among global B schools by Financial Times. And we celebrated! It is indeed a great feeling when you are in the school when it gets accolades. So we had a huge cake, and several pastries with the number 12 'Jell-O' ed on them. And then rather than have a candle, we had a huuuuuge ice sculpture that read the number 12 :). The aqueducts (I like calling those channels around the atrium aqueducts), were filled with water and flowers and ISB FT 12 motifs were put in as floaters. The whole school gathered in the atrium with pom-poms, noisemakers, party poppers and a whole lot of enthusiasm and literally brought the roof down with the celebrations! What a day indeed!! 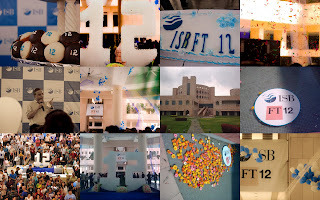 ISB as a brand is built not just by our faculty or by our current students. To a very large extent, the brand is dependent on the people who get into the outside world post MBA - the alumni. So, when the school takes in a bunch of really smart people, trains them with some of the best faculty world-over and sends them out to make a difference in the world, good things do indeed happen. And what is decidedly noteworthy is the fact that the school is hardly 8 years old. Several people expect an MBA to catapult everyone to posts of CEOs across the board. But I'd say that MBA is not like tequila (or tech school). It is more like wine. The more time you allow between making the wine and drinking it, the better it is. Likewise, the effect of the brand would begin to permeate through our lives as time progresses. A Rolex was not the premium, respected brand on the day it was launched. Over time it has garnered the respect and that automatically rubs on to the wearer today. But for me, the fact that I have had the oppportunity to be associated with several super achievers who were once students of this school itself is a humbling feeling. It just means that we as alumnus beginning April have a bigger role to play in taking our alma mater to greater heights. No one said being Amitabh Bacchan would be easy. But ask Abhishek and he'll tell you about the pressures of being Amitabh's son. So as we move on, the bar is higher, the expectations steeper, the effort needed greater, and the results sweeter. So with that thought and a deep level of determination, I say - ISB Rocks, and it is our job now to collectively move it higher. "20 < 15 < 12 < Next is what???" Well written and full of optimism.